The Tucson Man is a lumberjack that greets travelers as they whiz by. Despite the large axe, he looks like a cordial sort. Look familiar? No, it's not June, it's Big Johnson from Prescott Valley, AZ! This cowboy appears to be in great shape as he towers over stuff from a weekend sale. Heading a bit eastward, Arizona is home to quite a few classic roadside men. 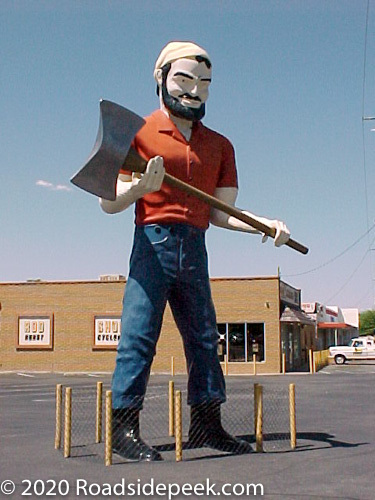 In fact, Northern Arizona University is home to not one, but two of the Lumberjack variety. One of the 'jacks stands guard over the football field and the other is located right outside the arena. In the beautiful town of Flagstaff, AZ, the Lumberjack Cafe Man used to stand guard making sure there were no "dine and dashers" looking to get off with a free meal. But alas, the Lumberjack Cafe and the Lumberjack Cafe Man are no longer there. Now this resident of Yuma, Arizona sports a smaller frame and a unique face. Don't want to call him paper mache' man so we'll just call him the Yuma Man. 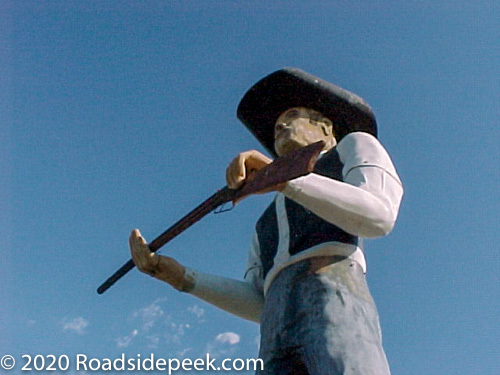 Mr. Yuma Man stands tall near a target off the main drag. Here's the Hobo Joe statue, located in Buckeye, AZ. This statue is similar to the type that used to grace the restaurant chain of the same name. 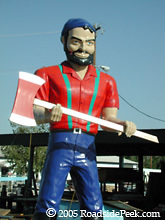 This lumberjacks stands in the yard of the Lumberjack Products in Phoenix, AZ. This guy was in pretty good shape with a good paint job a few years ago.